​Zoreza Energy Managed Storage (EMS) system is an all-in-one package with top-of-the-line, long life reliable, maintenance free Lithium-Iron Phosphate batteries, smart Battery Management System (BMS), high end software algorithms, and intelligent cloud based monitoring, reporting and controlling system. All packaged in one, for ten years of uninterrupted, hassle free use. 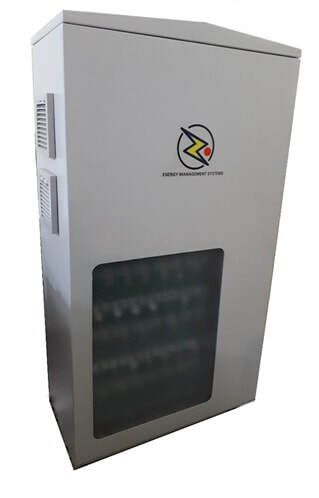 It can be used for storage applications, as a Smart UPS device, Solar PV backup for night, as an energy management system and run all your electrical load including several air conditioners. Zoreza EMS is a complete On-line system. No switching occurs during power outage and the computers, displays, ATM’s, displays, Game machines and electronic equipment do not reset. Due to low cost of stored energy and longer run time Zoreza can be used to replace the existing generator (Gen-set has a relatively high operational and maintenance cost). Generator has to be placed outside due to noise and smoke. Zoreza EMS is noiseless, pollution free and minimal size, so it is placed inside the room/building. Electricity blackouts are so common in our country with power outage due to planned load shedding or breakdowns, which lasts for several hours, depending on the locality and nature of the problem. More so these outages are unpredictable and cause lot of different nature problems. Zoreza EMS will supply household, office or business with stored energy, during these power outages without a blink (our 10Kwh unit can run five air conditioners along with other load). Zoreza EMS protects your equipment from damage due to voltage fluctuations, low voltage, spikes and missing phase voltages, which is often the case with Grid electricity from Utility companies. Double conversion, isolation and high quality filtration eliminates these problems.